As the leading business for emergency roof repairs in Miami, FL, Hialeah Roof Repair is devoted to not only install and repairing roofs to the maximum standards but schooling you on the effects of South Florida’s hurricanes and storms on your roof. Roof repairs during this time are frequent because the potential for roof damage is astronomical. If you are a victim of storm roof damage, and you are like, “I need my roof restoration service NOW!” this is where we come in. We guarantee our storm roof restoration will protect your property. Your roofing structure is the most vital part of your home’s weatherproofing. A damaged or leaky roof causes numerous problems and potentially costly home improvement repairs. Our Hialeah roofing contractors put the same attention and care into emergency roof repairs as they do into roof installations. The professional service we provide in roofing is unsurpassed by any other Miami emergency roof repair company. The end result is an accurately working roof that lets you enjoy your summer, without having to concern yourself about water damage to your property structure during hurricane and storm season. Hialeah temporary roof repairs vary from project to project. It takes skills and experience to identify the severity of the damage and choice the best repair methods for your roof. We have experienced Hialeah roofing contractors and advanced technology to diagnose and repair your roof. We recommend that you get a roof inspection for your South Florida before the storm season. This is your total first line of defense against roof damage. ​Roof repairs are a huge commitment, and as such, we go out of our way to guarantee that each roof repair technique is performed correctly. Restoring your roof is a huge project, and it is imperative to do your research to find the Miami roofer who meets your needs. Hialeah Roof Repair is the best company for emergency roof repairs in Miami, FL and the surrounding areas. With us, we provide temporary roof repairs, and then we schedule a consultation to discuss your roofing concerns. We have been in the business for years, and we understand the first step to any roof repairing is to listen to your needs and desires. Whether we repair or replace your roof, we proudly offer top-quality roofing services, including installing a leak diverter that isolates and redirects water, protecting your property. Roof repairs are often made after the storm, and hurricane damage is done. However, if you keep routine roofing inspections, you can avoid having to repair a leaky roof in the first place because your roof will already be durable enough to withstand South Florida hurricanes and storms. Roofing material is susceptible to breaking and cracking. A neglected roof costs way more than it normally would regarding destroyed walls and interior ceilings. Our roof repair team is ready to work on any type of roofing system you have. We can repair roof leaks, regardless if they are caused by overflowing, broken gutters or wind-driven rains. Whether the job is simple or complex, we have the craftsmanship to meet your needs within your budget and timeframe. If your roof necessitates 24-7 emergency roof repair, we have got you covered. At Hialeah Roof Repair, we set the standard for the best roof repair practices in Hialeah by using the most proficient roof repairing methods in emergency situations. Our greatest area of expertise is in major and minor emergency roof repair services. Our Hialeah roofing contractors are proud of their capability to assess your roof repair needs rapidly, affording us the chance to provide fast, affordable Hialeah 24/7 emergency roof repair service. With any property, we manage all roof repair tasks with a high standard of care and attention to detail. Our roofing work will make your roof strong and sturdy again. Our intention in emergency roof repair cases is to help extend the life of your roof. Our viewpoint is to diagnose and repair, not replacing your whole roof. We only replace your whole roof when it is absolutely necessary. Keeping up with the most up-to-date discoveries in the industry, we utilize state-of-the-art and cutting-edge technology and methodology. If there is a problem with your roof and you need immediate help, you have come to the right place. We can work and maintain roofs of all types or shapes, and we can assist you in deciding what roof products will work the best for you if you choose to get a new roof. We are not only devoted to repairing your roof but making sure that it is durable enough for the next storm or hurricane. We stand behind both our materials and our workmanship, and we provide the most cost-efficient and timely roof repair solutions. If you plan on selling your home or business and need to enhance the value of your property, repairing your roof is one easy way because the new owners will have one less thing to deal with. If you find yourself in need emergency roof repair services in the Miami, FL area, consider giving us a call. We stand apart from our peers by offering amazing craftsmanship with all our roof repair services. You will find our values of superiority, honesty, and integrity a refreshing change from the other Miami, FL area roofing companies you may have done business with. When deciding on a Miami roofing business, it is critical to pick one that is qualified, and you can trust. This is a big decision, as you want a roof that will stand strong after the storm passes over. 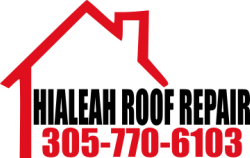 Hialeah Roof Repair is here for you. We'll be there to help pick the pieces and get you back under a safe roof.